Curtis Martin, who was just inducted into the NFL Hall of Fame. He is the fourth-leading rusher in NFL history. 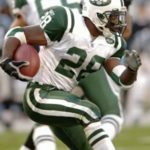 Martin oversees the Curtis Martin Job Foundation, which he funded throughout his playing career. He provides both financial aid and hands-on support to single mothers, children’s charities, individuals with disabilities and low income housing providers.